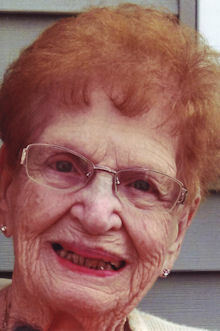 Carmella M. Lewis, (nee Campagna), age 96, of Lorain, passed away at the Mercy New Life Hospice Center of St. Joseph in the early morning hours of Wednesday December 19th, 2018. Born in West Carroll, Pennsylvania on March 5, 1922, Carmella had been a resident of Lorain for the majority of her life. She had also formerly lived in Pennsylvania and New Jersey. Mrs. Lewis had been employed in the dry-cleaning industry for more than a half century. She began her career with Crystal Clear Dry Cleaners on Broadway where she served as both a press operator and supervisor. She subsequently worked at Hallmark Cleaners, and then for the Hogrefe Family at Wayne Cleaners. At each entity she was entrusted with the most difficult and exacting of jobs due to her experience and expertise. Carmella knew no strangers and her door was always open to family and friends. No visitor ever left without some form of food or baked good to enjoy. She was an accomplished cook whose spaghetti recipe was often described as epic. She also was an expert baker who was known for her banana bread and lemon squares. She continued her baking even after moving to a local extended care facility and was proud to share her projects with her fellow residents. When not in the kitchen, Carmella enjoyed working with ceramics as well as crafting Christmas Trees out of costume jewelry. She was a parishioner of St. Peter Parish in Lorain. She is survived by her son Russell J. Lewis, II (wife Tammy) of Amherst, granddaughters Erica Scott of Lorain and Elizabeth Kellogg of Vermilion, great grandchildren Kayden Thomas, Violet Scott, Jade Scott, Landon Kellogg, and Liam Kellogg, and half sisters Martha Gibbs of New Jersey and Mary Perrone of Florida. Carmella was preceded in death by her husband of fifty-one years Russell J. Lewis, Sr. in 1997, father Gaetano Campagna, mother Mary Mauro (nee Tripoli), step-father Charles Mauro, and siblings Charles “Sy” Campagna, Joseph “Pepe” Campagna, Antoinette “Tootsie” Campagna, James Mauro, Charles Mauro, Joseph Mauro, Anthony “Nino” Mauro, Frank Mauro, and Samuel Mauro in infancy.